The West Highland White Terrier was originally a working terrier, developed to go to ground after small prey that inclueded rats, rabbits, badgers and foxes. The West Highland White Terrier is closely related to the other Scottish terriers, particularly the Cairn. Said to have been developed in Poltalloch, the breed was originally known as the Poltalloch Terrier. Legend goes that Colonel Edward Donald Malcom’s red terrier was mistaken for a fox when emerging from cover during a hunt and was shot. White pups were occasionally born in his litters and he began selectively breeding for that trait after the incident. 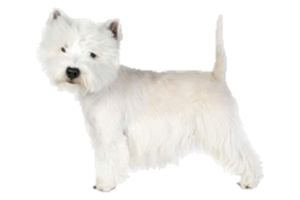 Is the West Highland White Terrier Right for You?